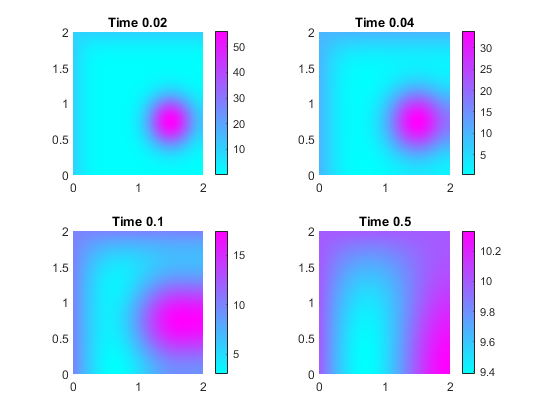 A TimeDependentResults object contains the solution of a PDE and its gradients in a form convenient for plotting and postprocessing. A TimeDependentResults object contains the solution and its gradient calculated at the nodes of the triangular or tetrahedral mesh, generated by generateMesh. Solution values at the nodes appear in the NodalSolution property. The solution times appear in the SolutionTimes property. The three components of the gradient of the solution values at the nodes appear in the XGradients, YGradients, and ZGradients properties. The array dimensions of NodalSolution, XGradients, YGradients, and ZGradients enable you to extract solution and gradient values for specified time indices, and for the equation indices in a PDE system. To interpolate the solution or its gradient to a custom grid (for example, specified by meshgrid), use interpolateSolution or evaluateGradient. Solve a time-dependent problem using the solvepde function. This function returns a PDE solution as a TimeDependentResults object. This is the recommended approach. Solve a time-dependent problem using the parabolic or hyperbolic function. Then use the createPDEResults function to obtain a TimeDependentResults object from a PDE solution returned by parabolic or hyperbolic. Note that parabolic and hyperbolic are legacy functions. They are not recommended for solving PDE problems. Solution values at the nodes, returned as a vector or array. For details about the dimensions of NodalSolution, see Dimensions of Solutions, Gradients, and Fluxes. Solution times, returned as a real vector. SolutionTimes is the same as the tlist input to solvepde, or the tlist input to the legacy parabolic or hyperbolic solvers. x-component of the gradient at the nodes, returned as a vector or array. For details about the dimensions of XGradients, see Dimensions of Solutions, Gradients, and Fluxes. y-component of the gradient at the nodes, returned as a vector or array. For details about the dimensions of YGradients, see Dimensions of Solutions, Gradients, and Fluxes. z-component of the gradient at the nodes, returned as a vector or array. For details about the dimensions of ZGradients, see Dimensions of Solutions, Gradients, and Fluxes. Solve a parabolic problem with 2-D geometry. Create and view the geometry: a square with a circular subdomain. Include the geometry in a PDE model. Set boundary conditions that the upper and left edges are at temperature 10. 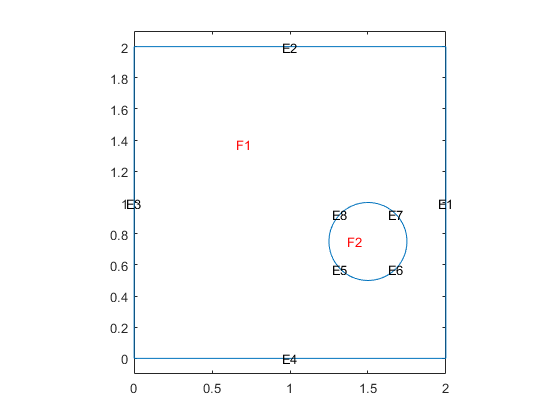 Set initial conditions that the square region is at temperature 0, and the circle is at temperature 100. Solve the problem for times 0 through 1/2 in steps of 0.01. Plot the solution for times 0.02, 0.04, 0.1, and 0.5.